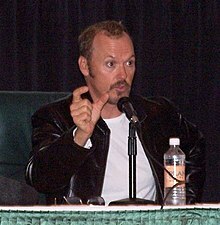 Michael Keaton (vere Michael John Douglas, natus 5 Septembris 1951 Coraopoli, in Pennsilvania) est histrio Americanus, notus ut puta Timothei Burton pelliculis Beetlejuice, atque Batman et Batman Returns, in quibus partes ipsius Batman egit. Anno 2002 in Frasier serie televisifica apparuit in fabella nomine "Wheels of Fortune", in qua partes hominis fraudulentissimi egit. Novissima mutatio die 21 Augusti 2014 hora 14:46 facta.